Liverpool manager Rafael Benitez felt Manchester United's Antonio Valencia dived to win a penalty that turned the game as the hosts came back to win 2-1. Fernando Torres put Liverpool ahead before Javier Mascherano was ruled to have fouled Valencia and Wayne Rooney fired in a rebound from his spot-kick. "The way he fell down is strange. When you see the replay it is suspicious how he went to the ground," said Benitez. Ji-Sung Park headed in the winner for United in the 60th minute. The result returned United to the top of the Premier League and damaged Liverpool's hopes of securing fourth place in the table and the final Champions League spot. 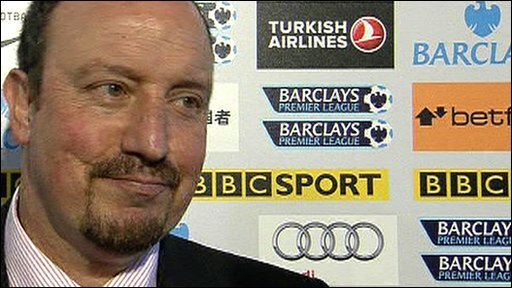 Benitez believes the penalty was the turning point of the match. "We gave away the penalty too early - but there are doubts about the penalty," stated Benitez. Asked whether he thought Valencia had dived, he added: "From the replay I think so. "The penalty made a big difference. We were playing well and had confidence and then one situation changed everything." There was also some doubt as to whether referee Howard Webb should have awarded a free-kick instead of a penalty as the initial contact between Mascherano and Valencia appeared to take place outside the area. But Manchester United boss Sir Alex Ferguson was adamant that Webb made the right decision, although he did question the fact that Mascherano was not sent off. "The referee was right, he tugged him down. He didn't bring him down outside the box, he didn't go down until he was inside the box. The decision was correct," said Ferguson. "I thought it was a red card. There was no way Jamie Carragher could get across and stop Valencia from shooting - he is too quick for Carragher to get across. "The law is if you stop someone from having a goalscoring opportunity it is a red card. Not today." Benitez disagreed with Ferguson - as he did during the match when the pair clashed on the touchline. "Jamie Carragher was coming inside so he was in the middle of the action [so Mascherano should not have been sent off]," retorted Benitez. And of their touchline exchange, Benitez added: "When you have different opinions you have to express them. He [Ferguson] has his own opinion about everything." Despite his grievances about the penalty, Benitez did not feel Webb was affected by Ferguson's pre-match suggestion that Liverpool benefit from many refereeing decisions that other sides do not. 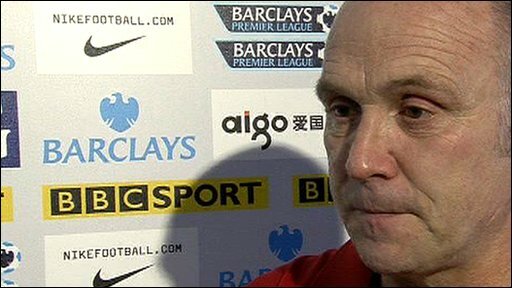 "Some decisions in the past have not been the best for us but I consider Howard Webb a good referee," commented Benitez. "The referees are professional. We know the influence of Sir Alex in everything but he is a good referee." The Spaniard also tried to put a brave face on the defeat. "It was a tight game and we had a good chance with Fernando or Yossi [Benayoun] late on," he stated. "United didn't create too many chances but they were always dangerous. It was close but the little things make a difference." United's victory, and Chelsea's 1-1 draw at Blackburn later on Sunday, means Ferguson's side now lead the Premier League by two points from second-placed Arsenal. This could be reduced to a point if Chelsea win their game in hand at bottom-of-the-table Portsmouth on Wednesday. Ferguson predicted that the title race will be extremely close but that his side have the qualities to emerge triumphant. "We have a very experienced back four, a very experienced goalkeeper and that gives us a real outstanding chance, albeit with seven difficult matches - but we have all got difficult matches, so what does it matter?" he said. "No-one is going away. We are all knocking on doors. "If you look at the run-ins for the teams, it could very well go to the wire."